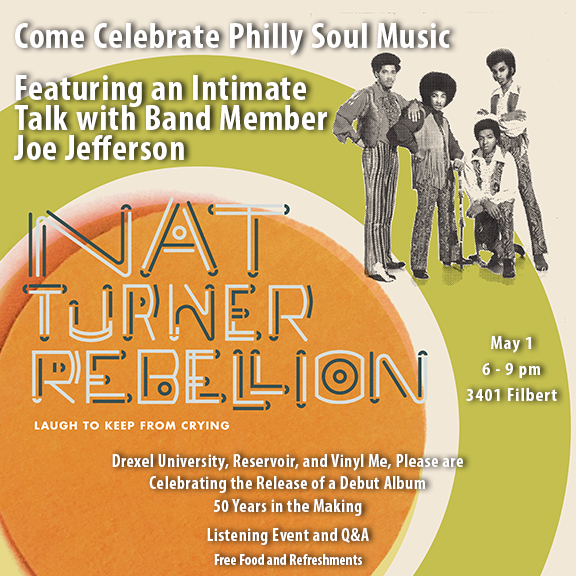 On May 1st, Drexel University, Reservoir Media, and Vinyl Me, Please celebrate the historic release of Nat Turner Rebellion's debut album Laugh to Keep From Crying some fifty years in the making. In a rare public appearance, the band's leader and sole survivor Joe Jefferson will discuss creating the radical scripture of Philly Soul that echoed through Black Power and funk rock movements during the late '60s and early '70s, and how its relevance and influence have only grown after a half-century in the vault. Read this feature at Rolling Stone to learn how the "long-lost classic" was brought back to life. The May 1 event, free and open to the public (with RSVP), will run from 6pm-9pm in Drexel University's URBN Annex (3401 Filbert Street), featuring a preview of a forthcoming, star-studded documentary on The Sound of Philadelphia, playback of the exclusive, sold-out LP pressing from Vinyl Me, Please, audience Q&As, free food, drinks, and more. In addition to Jefferson, panelists will include Reservoir SVP of A&R and Catalog Development Faith Newman, Drexel Audio Archives Director Toby Seay, Drexel Music Industry Program Professor Marc Offenbach, and Vinyl Me, Please Senior A&R Alex Berenson. Also in attendance will be musicians, studio engineers, and VIPs from the fundamental years of Philadelphia's indispensable Sigma Sound Studio, from which Drexel's Music Industry Program acquired and preserved recordings for Laugh to Keep From Crying and over 7,000 other master tapes.